A major breakthrough in the field pertaining to IVF. Yes, its true! 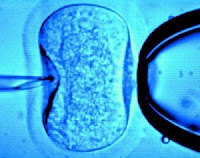 British scientists 've developed a one-minute online test which can predict couples' chances of conceiving a baby through In vitro fertilisation (IVF). Researchers from the Universities of Glasgow & Bristol 've created a free online programme that can give 99% accurate prediction. The test uses nine simple questions for the visitors to predict the chances of baby through IVF. Researchers said that the test can also help couple to go for treatment after the prediction if found any problem in the conception. The test was carried out taking background information about 150,000 people who were going through IVF treatments in Britain during 2003-07. The test predicted accurately & couples were benefited a lot through the online test. Click & promote this post!